Among the many strengths of The Seven Samurai are its economy and directness, which the film sustains throughout its long running time. These qualities are evident right from the opening scene, where a group of horse-riding bandits look down at a hillside village and decide that they will attack it once the crop has been harvested. A terrified peasant overhears these plans and reports back to the villagers. After consulting with a wise elder, they decide to hire itinerant samurai to protect them from the bandits, in exchange for food. They travel to a nearby town in groups to look for master-less samurai (ronin), but their offers are rejected. Then they happen to witness a rescue operation performed by a composed, elderly samurai named Kambei; he agrees to help them and sets about assembling a band of warriors for the task. We are introduced to these recruits one by one, and we also meet the swaggering, clownish Kikuchiyo, a man who was born a peasant but is trying desperately to cross over to the warrior class – to become a samurai by dint of his actions. He is eventually allowed into the group and preparations begin for the battles ahead. I was wrong to think of “action” in The Seven Samurai purely in terms of the actual battle scenes; Kurosawa’s mastery of shot composition and sweeping camera movements bring a kinetic energy to even the quieter scenes. The film is full of superb setpieces, such as the shot of Kikuchiyo sitting on a rooftop with the samurai banner in his hand, suddenly looking up at the hills and seeing dozens of bandits riding down towards the village. But remarkably, each of these scenes also has a built-in intimacy. Never do you get the sense that the action in this film exists in isolation – it is informed by, and enriched by, what we gradually learn about the characters. Like Sholay, The Seven Samurai is much greater than the sum of its parts. Still, the personalities of its two most prominent characters, as well as the performances of the actors playing those roles, make for a fascinating contrast: Takashi Shimura as the charismatic, soft-spoken but authoritative Kambei, who inspires and leads the samurai; and Toshiro Mifune as his polar opposite, the loud-mouthed but endearing Kikuchiyo, who constantly betrays his insecurities by trying too hard to impress. If Kambei is the cerebral force of the film, Kikuchiyo is its emotional centre, its beating heart, and Shimura and Mifune (whose roles in the earlier Kurosawa films Stray Dog and Drunken Angel are worlds removed from their roles here) are both exemplary. As played by Shimura, Kambei exudes integrity and discipline, but he never comes across as humourless or dictatorial. The warm, self-effacing smile on his face is the smile of a man who has learnt, through hard experience, to be stoical about many things, and it’s easy to see why the others hold him in reverence. Mifune, on the other hand, makes the most of the flashiest role in the film – this is one of the greatest comic performances I’ve seen (and one that Dharmendra’s Veeru in Sholay owes a big debt to, as Anangbhai points out in a comment on this old post). Scenes like the one where Kikuchiyo sounds the alarm in jest and then makes fun of the villagers’ panicked response, or when he steals a gun from one of the bandits, or tries to master a recalcitrant horse, all make for superb physical comedy. Time and again, we get evidence of what Kurosawa meant when he observed once that Mifune “could convey in a single movement what it took most actors three separate movements to express”. At this point, the young ronin Katsushiro – unaware of what has transpired between Kikuchiyo and the other samurai – approaches, starts to say something in a friendly tone and draws back as Kikuchiyo snarls and waves a spear at him. Kikuchiyo then jumps up and stalks away. The village children come running after him (he is, after all, the most accessible of the samurai and the villagers have become charmed by his constant buffoonery) and in a very judicious use of sound editing, we hear the children’s combined cries of delight before we see them enter the screen from the left. (It's a bit like bird sounds.) Kikuchiyo turns, stomps his feet at them and continues walking away; even though he should by rights seem like a threatening figure here, his movements are childishly petulant, and the scene is a reminder that this is a boy in a man’s body. There is immense energy in this nearly wordless sequence, made even more forceful by the dust sweeping across the background, a reminder of the strong wind constantly blowing through the village, dramatically heralding the action that lies ahead. (Heavy rain plays an equally vital role in the final battles.) And it defines Kikuchiyo’s character (his internal confusion, his uncertainty about his place in the world) more effectively than pages of dialogue could. But like I said, it's only 30 seconds in a great three-and-a-half-hour film. P.S. for more about the film’s subtexts – including the story’s relevance to early 20th century Japan – see this lengthy review on the DVD Verdict site. And Donald Richie’s book is a must-have for any Kurosawa fan. P.P.S. Anyone interested in doing me a good turn many kindly gift me the three-disc edition of the film released by Criterion, which has a treasure trove of supplementary material. The DVD I own only has a shortish video essay. Yeah this is a good movie. And the scene is one that we also fondly remember. But how could the high point not have been Rashomon ? That is a truly great movie. Coincidence! I watched the movie last week as well (for the first time. 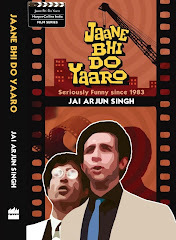 )Thanks Jai for a nice review. My favorite scene is at the end when the farmers are back to tending their farms, Katsushiro is looking lovelorn, and Kambei looks at the scene and the shrines to the fallen samurai and mentions 'they won we lost' or something to that effect. The length of the scene is about 5 minutes. Its unhurried pace after all the 'action' comes as a contrast and seems to emphasize that after the hurly burly of war life moves on. On an unrelated note, the scene made me think reflect about the callousness with which we tend to treat war heroes. (this is nicely portrayed in the Land of our fathers or maybe by Jack Nicholson's 'speech' in the courtroom scene of A Few Good Men). I started watching Kurosawa films by wtaching 'Rashomon'. I also bought Seven Samurai, Sijoru and 'Blood Throne' (I hope thats the name). The camera work in his films is really good. And the plus point of the DVD's is the commentary by Donald Richie. Seven Samurai is a brilliant film. Revisiting these classics brings back nostalgia of the time when I first watched it as a teenager. On another note if you are interested in second world war events. I would also suggest Tora! Tora! Tora!. It reviews the attack on pearl harbor with much more depth and an analytical frame than a pedestrian Ben Affleck starrer 'Pearl Harbor'. Although for some the movie seems more like a documentary for me it is more a Plot centric movie rather than a character driven movie , which can sometimes work if the intentions of the director are honest. I was stirred the first time I watched this movie, and organised a screening of it in college. We made very persuasive advertisements and gathered a fair crowd of about 60 people. (Considering the turnout for The Apartment was only 3, this was a huge victory). Within an hour, most of the crowd had left. People still curse me for making them watch 'a random, boring Jap movie where people run funnily'. Nightwatchmen: for me personally, Rashomon falls in the category of films that I admire from a safe distance while not really being passionate about it. But even "objectively" speaking (whatever that might mean), I think Samurai is a more adept, more consistently satisfying film. Sachin: yes, the last scene is a very nice, apt coda. Shwet: Saw Tora Tora Tora a long time ago. While I'm not a Pearl Harbour fan (to say the least! ), I don't think it's fair to judge it on the basis of how analytical or indepth it is about the attack - the film doesn't set out to be anything other than a romantic melodrama that conveniently uses a dramatic historical setting. Karthik: you mean Sanjuro (not Sijuro)? You should really see that after Yojimbo, it's a sequel of sorts. Mayank: thanks a lot for the offer, but that was just a lightweight PPS. I really shouldn't be too greedy about these things, seeing that I have so many DVDs (and special features) of my own to get through! How dense of me to treat an obviously light-hearted remark! I am glad you bring a certain gravitas to blogging. Very beautifully analyzed. Its almost as if you reached deep down into my subconscious and told me things that I already knew but never thought about. Renting Richie's book this afternoon from the library. Maybe I'll buy it. Let's see. The film has so much action (and I don't mean dishum dishum) that you don't realize when the three and a half hours whiz by. Predictably enough, this was the first Kurosawa film I had seen, and I remember having to pause after the first thirty minutes to breathe since the subtitles felt really quick. Personally, I think Rashomon is a slightly better film technically speaking, but it almost seems as if Kurosawa was more passionate while filming Seven Samurai than Rashomon and the result shows. 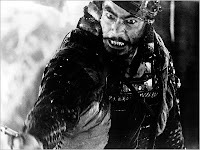 Having said that, I think this is Mifune's best performance I have seen. I would rate this over his Yojimbo performance since it is very difficult to pull off good physical comedy. jai--have you read helen dewitt's "the last samurai"? you really should. you discuss this film so wonderfully well. "you mean Sanjuro (not Sijuro)? You should really see that after Yojimbo, it's a sequel of sorts" Not sure whether they were meant to be sequels but for me Yojimbo was far superior to Sanjuro. 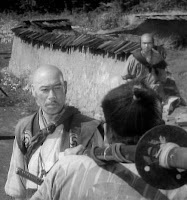 In Sanjuro, at times it seemed as though Mifune had overtaken Kurosawa.